Pyschostick Talks New Album "Revenge Of The Vengeance"
Psychostick is back, and thanks to the crowd funding efforts of fans, the musical institution will again address truly important topics, like the intoxicating allure of beards, voting for President Rhino (who will answer the tough questions and get a real political dialog going in this country), the love dogs have for socks, and the all-encompassing power of Bruce Campbell. All of these issues and more will be addressed on "IV: Revenge of The Vengeance," due out on November 4th, 2014. Before the album's release, the band needed to connect directly with the fans to thank them for their support and deny any vicious rumors that an upcoming song will be about "Sharknado." See what the comedy metal troupe had to say below, including a scandalous and patently false claim that the universe imploding into a singularity would be a bad thing. xFiruath: You guys crowd funded this new album – how did the campaign go and how has this process been different from previous releases? 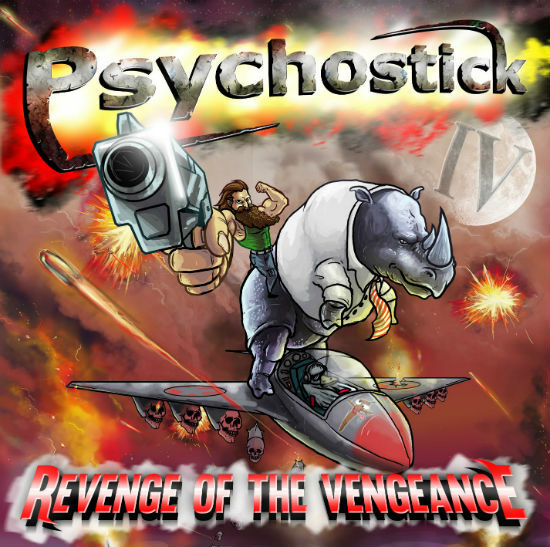 Do you see this as the way Psychostick will continue to operate in the future or you do you think you'll go a more traditional route next time around? From here on out though, I think we're gonna try to focus more on creation and other things now that we have a studio. Hopefully we won't need to crowdfund again, which would be a great "problem" to have. Right? Some of the tracks were written and already recorded (“Dogs Like Socks,” “Obey the Beard”), but most of them were freshly plucked from our brain meat. We recorded the album in our new studio funded by our fans via Indiegogo! Then, we worked with ourselves and our video director/creative lunatic buddy, Patrick Murphy. xFiruath: I'm looking at the cover and trying to understand what the hell is happening on this album. Pure insane stupidity and a sort of movie sequel theme. It's pretty out there. xFiruath: Who handled the cover artwork, and more importantly – who let that rhinoceros out of his proper office setting to ride a fighter jet? WE let the Rhino out. Dude needs to represent. We have some amazing artists that help us out with our shirt designs. The awesome feller who did the artwork is our buddy Aljon, who is a huge fan and lives out in the Philippines. Super talented and hard working guy. xFiruath: Your songs have covered everything from Bruce Campbell to obeying beards, which leads to the natural question: will there be a song about Sharknado? If we did a Sharknado song, I think the universe would implode into a singularity. This is bad, FYI. xFiruath: Where are you heading out on tour in the near future and are there any locations you are really looking forward to visiting? We are going all over. Check out our website for where we are headin'. I'm really looking forward to going to Vermont for the first time. Then we'll have Alaska and Hawaii to play to cover all 50 states! Hooray! xFiruath: So this is old news at this point, but that clip for “Dogs Like Socks” was among the greatest music videos of all time – how did the idea for that come about and how did the filming of that go? Funny story. Matty (out bassist) was playing with the two dogs you see in the video and chanting, "I'm a dog, I like socks." Josh walked in on this and they created the song. All the footage was done via iPhone, I think. Haha. Yay! xFiruath: Outside your own music, what have you been listening to lately and what's coming out soon you are looking forward to? I've been listening to Manchester Orchestra, and I'm not super up to speed on what's coming out. Avengers 2? Yeah, that'll be awesome. xFiruath: Are you active in your local music scene, and what's happening with rock and metal in your town these days? Honestly, we aren't. We're so busy going all over the place that we can't keep up with local events. We try to though. Yes, Please like us on Facebook and/or Twitter. We're all over the place online, so say hi. "Revenge of the Vengeance" is our new CD and will be out on November 4th, 2014! Please pre-order and get some goodies! And... someone buy me deep dish pizza. So many NOMS. 0 Comments on "Pyschostick's Vengeance Finally Gets Revenge"